Tomko get’s KO’ed and Parker gets the call! 4th game of series, My 4th game in the Springs this season and second of this series. As far as total amounts of goes this year I lost count about 3 weeks ago! When I got into the stadium Christian Fredrich who pitched Friday’s game I was at was doing his bull-pen session. So as the players came out and warmed up I got a few autographs, I got Kyle Parker to sign a PCL ball and also got Delta Cleary Jr. on a ball. 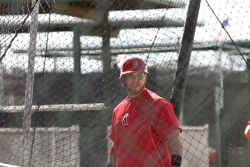 He was just called up to the Sky Sox on Saturday from Tulsa. I also got 3 others including Ben Paulson and Angelys Nina in my spring training program. 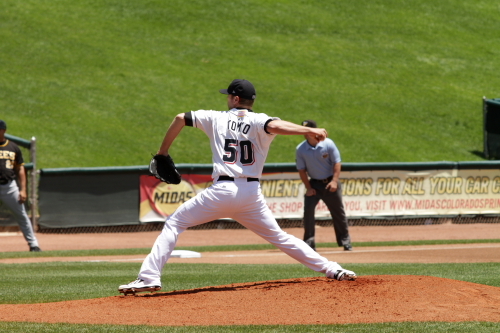 Brett Tomko was the starting pitcher for the Sky Sox today and pitched terrible. There is just no other way to explain it He walked the first Bee’s batter he face and than gave up a single to the second Ex-Rocky Tommy Field. After striking out the next 2 batters things looked like they where coming together. 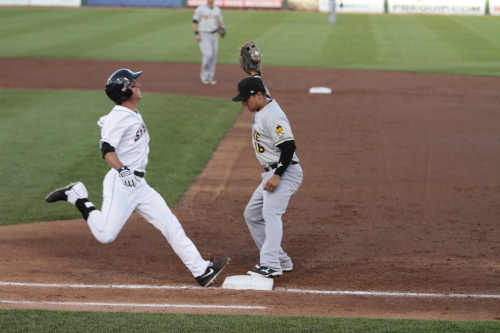 That did not happen and He walked Brennan Boesch and then Luis Jimenez single that scored the Bee’s first run. Tommy Field running to first for his 1st. inning single. Kyle Parker playing 1st. base. 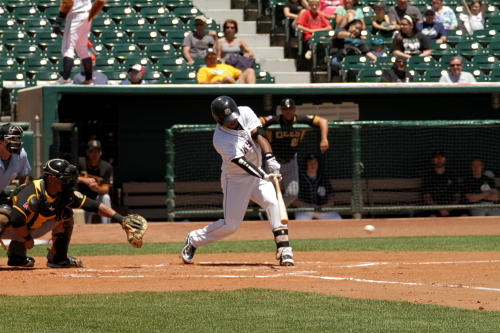 Luis Jimenez hitting his single that scored the Bee’s first run. Paul Janish made an attempt at the ball and missed it to give Jimenez the single. After the run scored, Manager Glenallen hill came out and took Tomko out of the game. He pitched 37 pitches in 2/3rds of an inning, he is responsible for 3 runs on 2 hits, walked 2 and well he did strike out 2 batters. 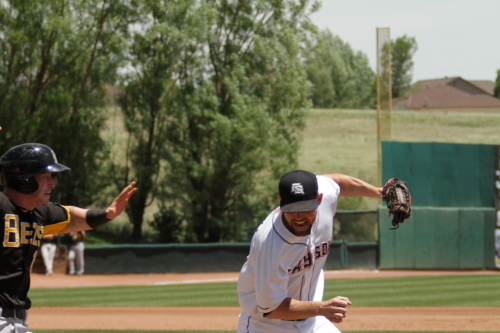 Greg Burke came in to pitch the rest of the inning for the Sky Sox and 2 of the 3 runs scored on a ball hit to Tim Smalling at first who made an error that scored the 2 runs. 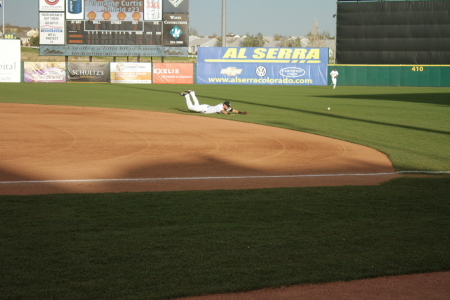 Jimenez was then thrown out at home trying for the 4th run to end the first inning. Now if you noticed earlier I put a photo of Kyle Parker up playing first and then Smalling made the error. It was because during the pitching change Glenallen Hill removed Kyle Parker from the game because he got called up to join the Rockies in L.A. It was interesting to see him come up to bat on T.V. 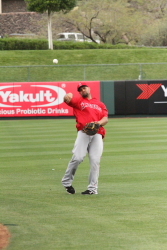 in L.A. when I saw him start a game in the Springs at 12:30.P.M. That night he struck out during his first MLB at bat. The Above photo is Greg Burke trying to get Zach Borenstein out at first after the Smalling error. 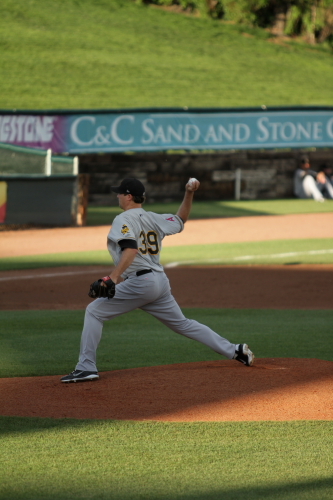 Justin Thomas started for the Bee’s he also started the inning with a walk to the first batter he faced Rafael Ynoa. Ynoa tossing the bat and heading to first. Jackson William then hit a to score Drew Garcia and Nina to tie the game at 3. Both teams would go down in order in the 2nd. 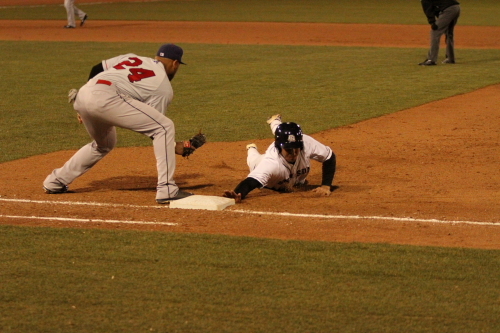 The Sky Sox would score again in the 3rd. The first run of the inning was on a second Williams single and the 2nd on this bunt by Delta Cleary Jr. that was fielded by the Bee’s pitcher. Which he flipped with his glove high to the first baseman Grant Green for a bunt RBI single. 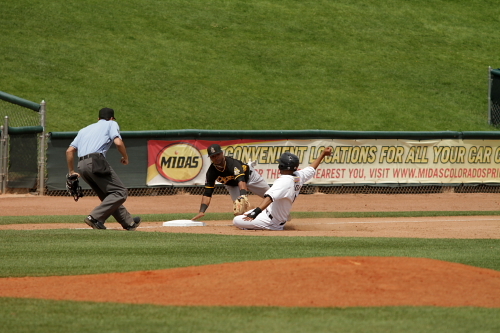 Ben Paulsen score the Sky sox 5t run and gave them a 2 run lead. 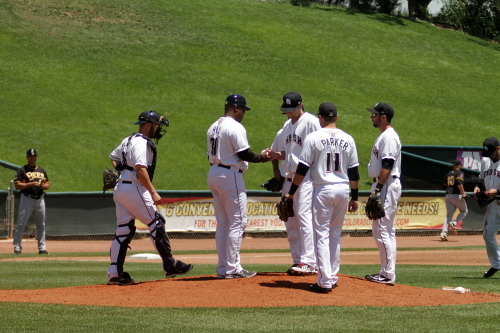 Wilton Lopez came into pitch for the Sky Sox in the 6th inning. 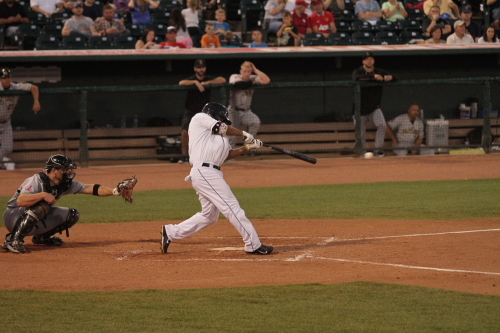 Grant Green would hit a double and then score on a double by Efren Navarro. That run tied the game at 5. The bee’s score a second run in the 6th, a Borenstein single that scored on a Luis Martinez single to give the Bee’s a 7-5 lead. 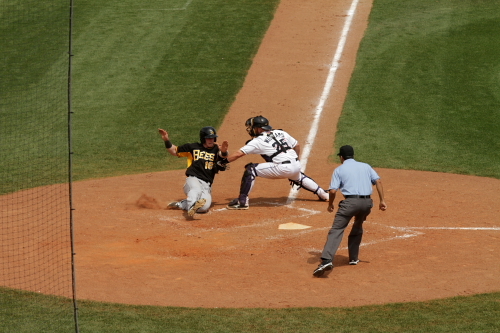 Borenstein was tagged out at home for the 3rd out of the inning. In the bottom of the 6th the bee’s brought in relief pitcher Jeremy Berg who was a side arm pitcher which is always crazy to watch I could not imagine trying to hit off the motion of these guys. Berg pitched the rest of the 6th inning and the whole 7th inning. He struck out 3 batters in his 1 1/3rd inning. Ynoa gets tagged on a Nina hit to Tommy field at short for the second out at 3rd. 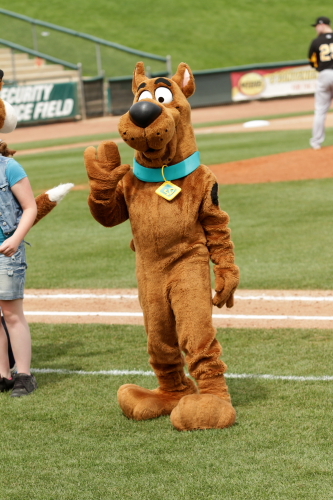 Well that answers that Question Scooby-doo where are you?! He was at Security Service field for this game! He also announced the batters during an inning. The Bee’s scored a 7th run in the 8th inning to extend there lead to 7-5. 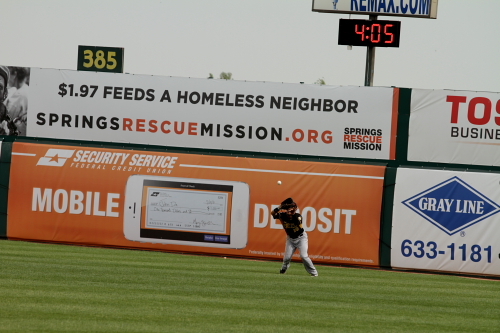 That was caught by the Bee’s right fielder Efren Navarro for the final out of the game and the final was 7-5 Bee’s. That is it for this game from the Springs. The Rockies return home this weekend against the Milwaukee Brewers and next week against the St. Louis Cardinals. I am also planning my 2014 road Trip which should be interesting! Check back for where I will be going! The Bee’s are a triple A affiliate of the Angels. This was the first game of the series. My 3rd game at the springs this year. Christian Fredrich was the starting pitcher for the Rockies. Christian has been having a rough season on the mound tonight was no different. It did start out very well he struck out the first 2 batters he faced in the 1st and got the 3rd out on a ground ball. 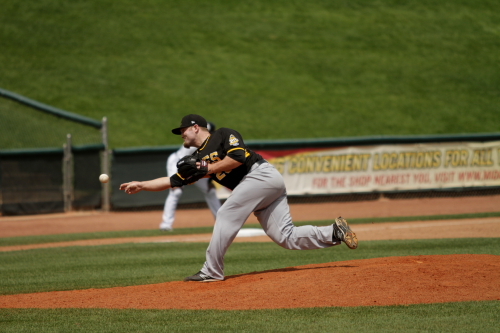 Jarret Grube started for the Bee’s He also sat the 1st 3 batters he faced down in order. 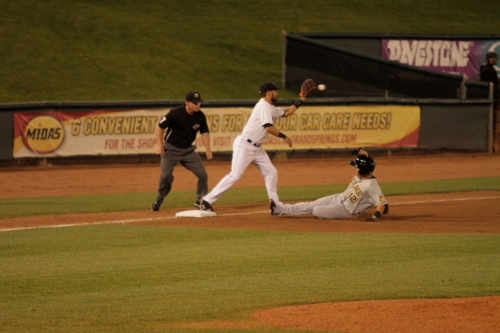 John Hester in the 3rd inning hit into a double play to get Luis Jimenez out at second and himself out at first. 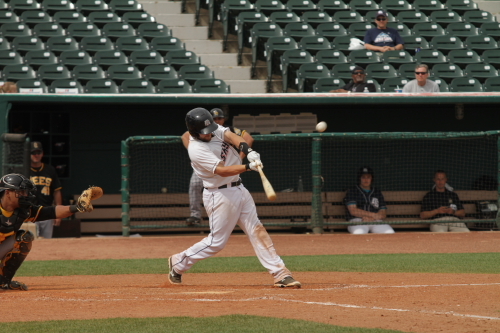 Evan Frey attempts a bunt base hit in the 3rd inning, but was thrown out at first. 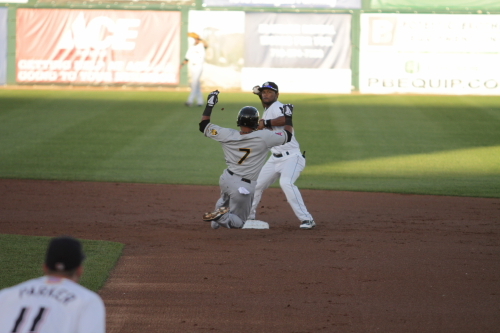 He wasn’t out by much the ball just beat him to the first baseman Efran Navarro. 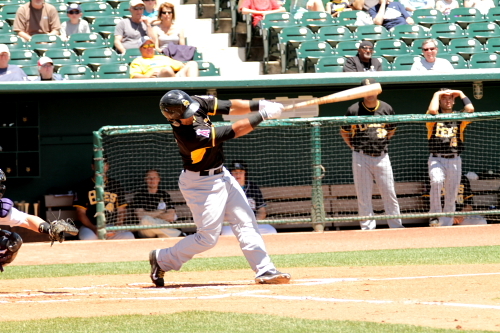 Rafael Ynoa Taking a swing during his 3rd inning at bat. seems like all the good photos in this post were outs! But since the 2 pitches did not allow many hits till the 4th inning most were early in the game. The Sky Sox really got things going in the 5th inning. 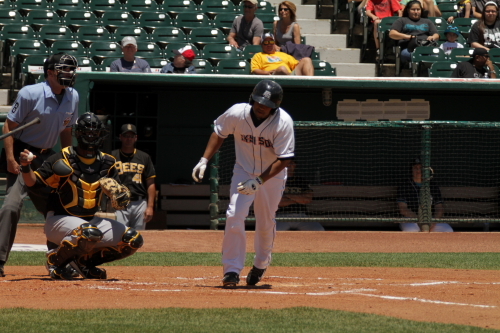 Ynoa hit a single that score the Sky sox second run of the game. Scoring Evan Frey from third. 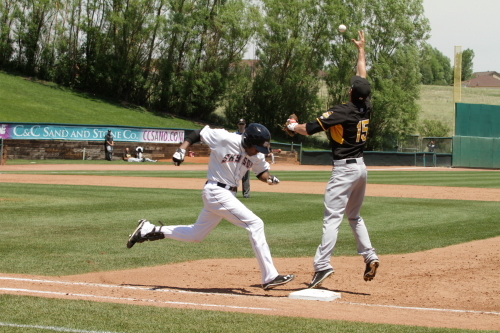 The Sky Sox scored 5 runs in the 5th 2 more from some small ball and 2 from a Ben Paulson home run. 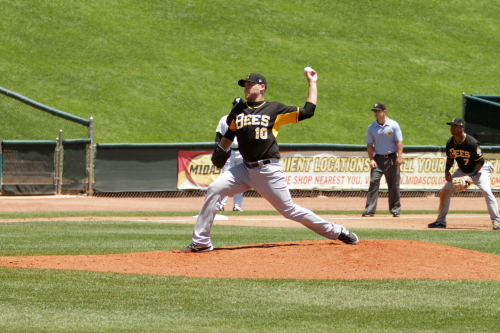 The bee’s stung Christian Friedrich in the 6th after loading the base with 1 out. 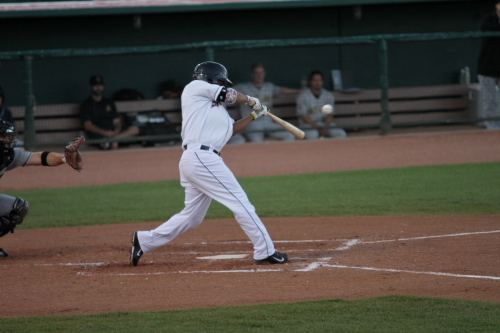 Efran Navarro hit a grand slam home run to cut into the Sky Sox 6 run lead to 6-4. Navarro high fives the 3 batters that were on base for his home run. After facing 4 more batters and giving up 4 more hits including doubles by Brennan Boesch and Luis Jimenez each scoring runs Christian was removed from the game. He gave up 7 runs in this inning on 7 hits just in this inning. For the game he gave up 7 runs on 11 hits striking out Striking out 3 and walked 1 which was also in the 6th inning. He was replaced by Wilton Lopez. He got both batters he faced out in the 6th and pitched into the 7th. He pitched really well in the 7th got the first batter in the inning to pop out and then struck out the next 2 for a 1,2,3 inning. 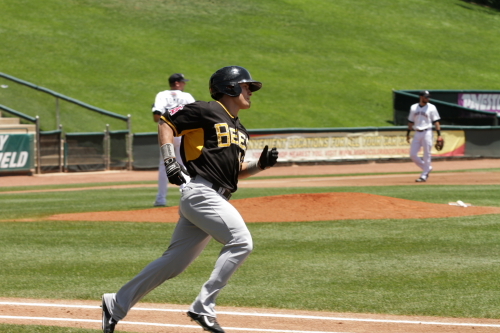 Tommy Fields (yes, former Rocky) started the 8th inning with a triple and he would score on a Boesch single to give the Bee’s a 8-6 lead. That would be the final score as well and after a good start Friedrich would continue with is not so good year. That is it for this one from Security Service Field. I have another one from the final game of this series to come. 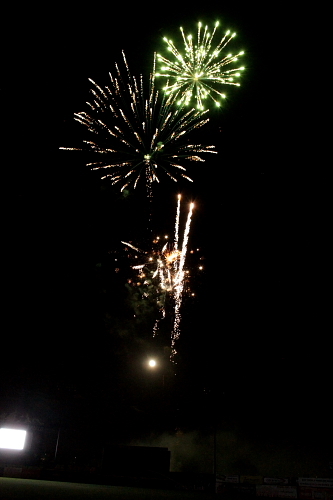 After the game like the do every Friday night they had fireworks! Walkin off in the Springs! My 2nd Sky Sox game of the year. 24th game in total for the year! This was my second trip to the Springs this year. Like always I headed out behind the stadium to see if I could find some baseballs and did not find any. We then headed into the stadium. I went with Mariano and Jared. After we entered the stadium we headed to the Redbirds side of the field. After finding out the one player I had cards for was sent back up to the Cardinals I headed to the Sky Sox side of the field. I got GlenAllen Hill to sign a copy of the program and also had Kyle Parker to sign a card. I also got Mike McKenry on Mariano’s Rockies team ball, a 8×10 signed by Christian Friedrick and 3 others in my spring training program so not a bad day for graphs. Every thing I brought to be signed was. It did help that I did not have much! The players lined up during the National Anthem. Today I did something I have never done at a game before and that was take every photo with nothing but a wide angle lens! I did not feel like caring my large zoom for this game, 1 because I felt lazy this day and 2 the lighting stinks at this stadium and I really did not feel like taking a camera to begin with. 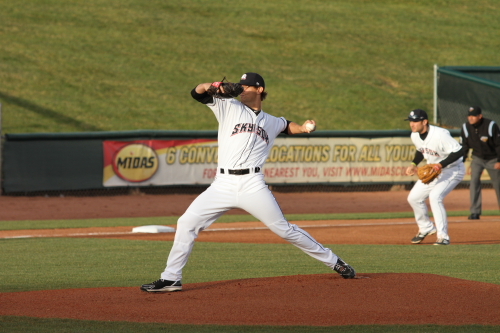 Christian Bergman was the starting pitcher for the Sky Sox. 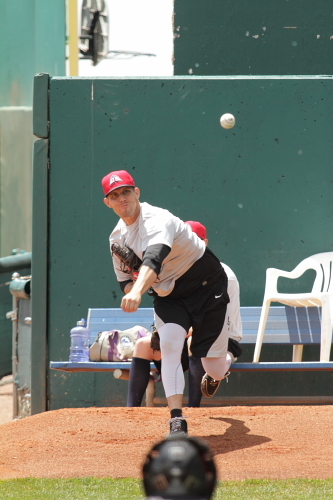 Zach Petrick started for the Redbirds both pitchers had 1,2,3 inning in the first. Both aloud runners in the 2nd. 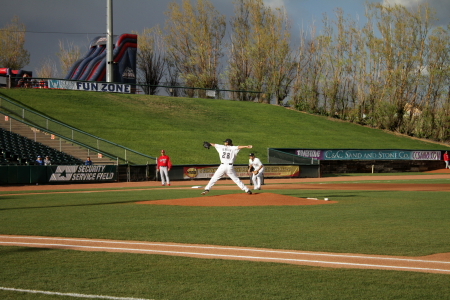 Jason Pridie grounded out to start the game for the Sky Sox. The second Redbirds hit was by Jermaine Curtis that got past Paul Janish at 2nd in the 2nd inning. Now this game was a pitching duel and well there were not many hits and due to the wide angle lens there were not many photos! 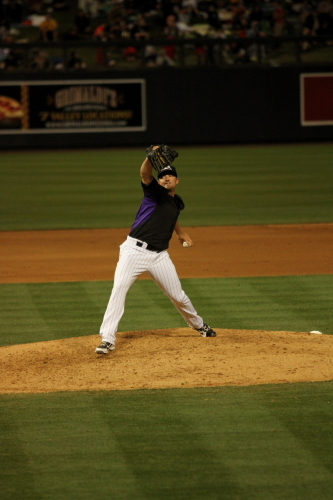 There were no runs by either team and the Sky Sox Brought Chad Bettis into pitch the 9th inning. With 1 out he did give up a double to Scott Moore and walked Curtis. Bettis got out of the inning on a ball hit by Luis Mateo to end the inning. Christian Bergman pitched 8 complete inning giving up 4 hits no runs and struck out and walked 2. A look from behind home plate during Ben Paulsen’s 9th inning at bat. 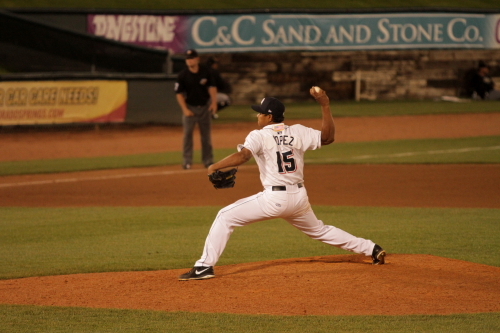 Sam Freeman who pitched the 8th started the 9th inning for the Redbirds. Zach Petrick pitched 7 complete inning giving up 3 hits, no runs and struck out 3 and walk 1. 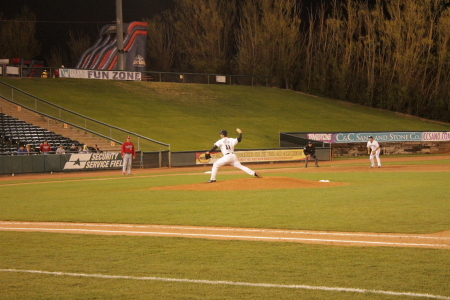 Freeman struck out the first 2 Sky Sox batters of the inning Ryan Wheeler and Ben Paulsen. 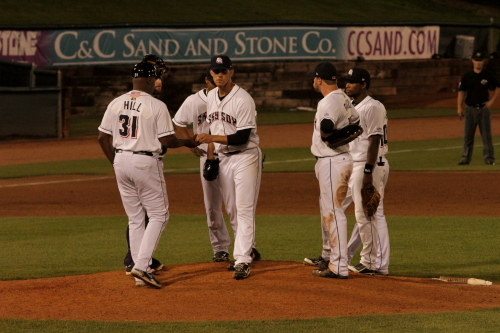 Freeman was taken out of the game after a single by Tim Wheeler and Jorge Rondon came into pitch for the Redbirds. The game went to the 10th inning and the Redbirds failed to score or get runs in the inning off Bettis who continued to pitch in the 10th. 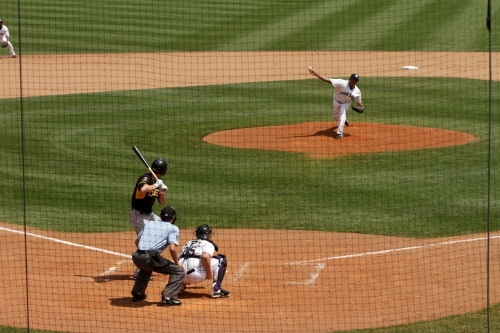 rondon also continued to pitch for the redbirds in the 10. He walked pinch hitter Rafael Ynoa who would score the only run of the game after singles by Jason Pridie and Josh Ruthledge. 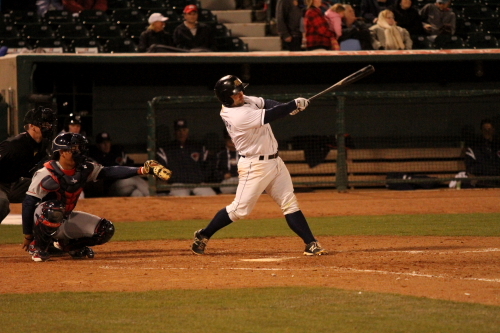 With base’s loaded Kyle Parker hit a single that scored Ynoa and win the game for the Sky Sox 1-0. This is only the second time in Sky Sox history that they went to extra inning scoreless. 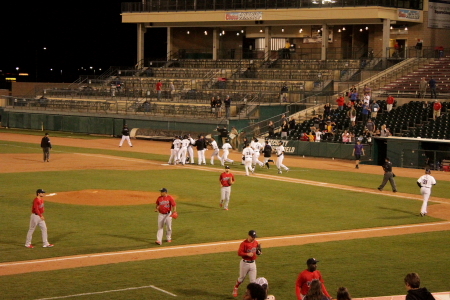 The Sky Sox clear the dugout for the celebrating at 1st base. This was a very good pitching battle and this was the first time I have seen Bergman pitch. He has been having a good year he is 3-2 on the year with 9 starts he has pitched 58 1/3 innings, striking out 35 with a 3.25 ERA. He did not get the win tonight because he came out with a 0-0 score and his record does not reflect what he is actually doing because of his no decisions like in this game. That is it from the Springs I will be at Coors for the Giants series. I delayed this post because of the Nolan Arenado walk off at Coors in the first game against the Giants! 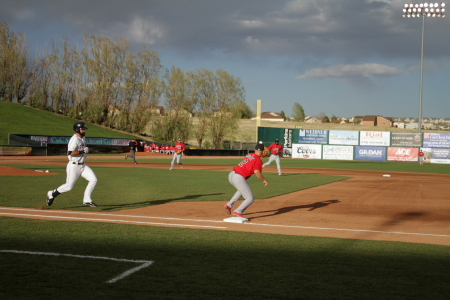 Sky Sox fall short to the Redhawks. The Redhawks are the triple A Affiliate of the Houston Astros. This was my first game to the Springs this year. This day started really early for me I left my house at 7:15 in the morning to go snowboarding at Keystone. After 19 lift rides and 30,000+ vertical feet and 5 hours of snowboarding I took the 135 Mile drive from Keystone, Colorado to Colorado Springs. I took about 2 hours and 15 minutes. 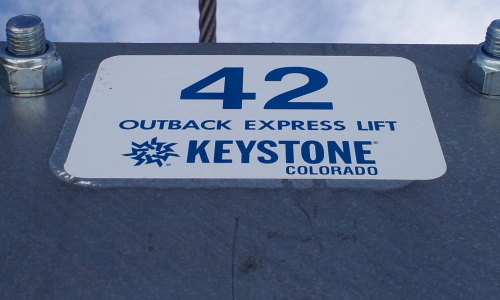 It being Jackie Robinson Day I got on chair 42. It took about 4 runs to sink up and be able to get on this chair 3. After arriving and getting my ticket I did some early Easter Egg hunting out behind Security Service Field! 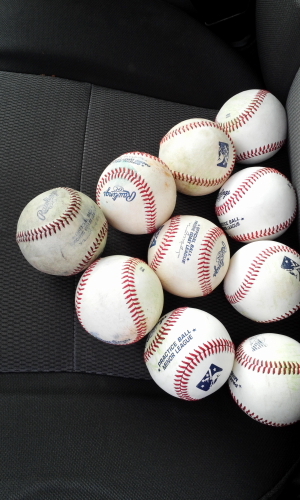 found 10 Baseballs Most Minor League Practice balls and a few Pacific Coast League baseballs. After waiting for Jared to arrive we headed in to the stadium. Christian Friedrich was warming up in the bullpen. I was able to get Wilton Lopez on my Rockies team project since he was sent down a few days ago. It was then time for the game to start. Christian Friedrich throwing the first pitch to the Redhawks Austin Wates. 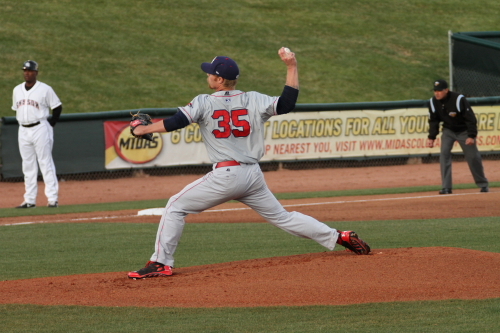 The starting pitcher for the Redhawks was Michael Foltynewicz. He also started the game with a strike out his was looking to Jason Pridie. 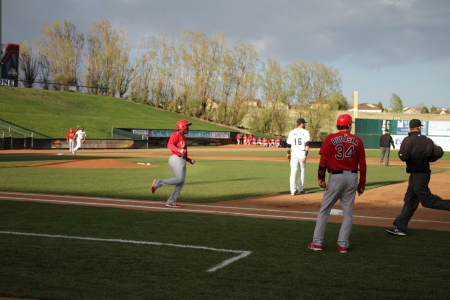 Tim Wheeler would hit a double but would not score, the Sky Sox did get a second base runner on base it was Matt McBride who walked. The Redhawks got the best of Friedrich in the second Ronald Torreyes started the inning with a single followed by a Wates single. Friedrich walked the bases loaded, walking Gregorio Petit. 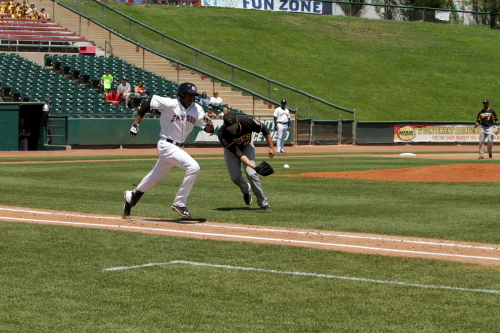 The fourth batter of the inning was George Springer who hit a grand slam to give the Redhawks a 7-0 lead. Springer was called up to the Astros the next day and made his MLB Debut he went 1 for 5 with a walk in the game against the Kansas City Royals. In this game he went 3 for 4 with a walk. After the Springer homer Friedrich settled down and got the next 3 batters out to end the inning. he then pitched well the next 2 innings sitting down 9 Redbirds batters in a row. 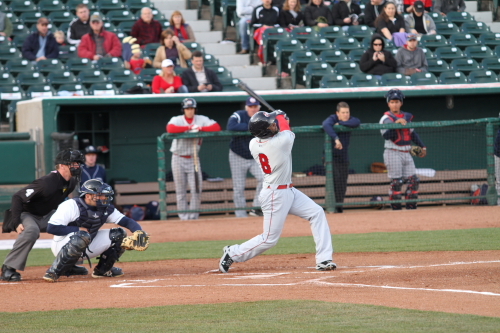 He would give up a lead off double to singleton in the 5th who would score and the Redhawks had a 8-0 lead. 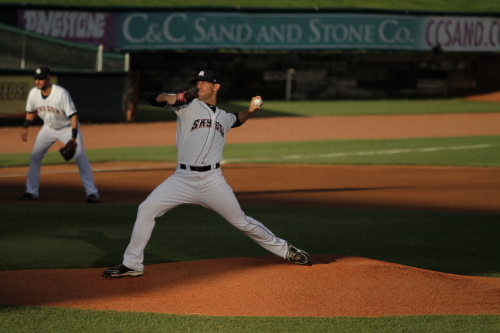 Mike McKenry got things started for the Sky Sox in the 5th with a double. He would score on a Tim Wheeler single. 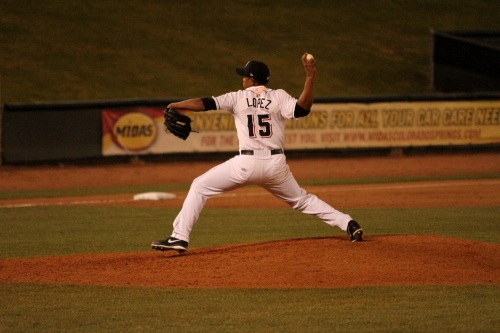 Wilton Lopez came into pitch for the Sky Sox in the 6th inning. Christian Friedrich left the game after 5 innings giving up 8 hits, 8 runs, walking 1 and striking out 4. After settle in and falling behind the 5 runs he did then have 2 good innings. It still looks like he needs some work but looks like he will be back to the way he pitched 2 years ago soon. 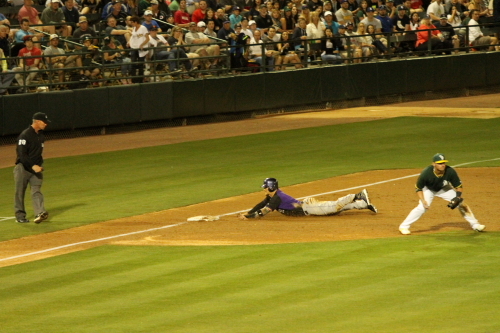 Matt McBride led off the 6th for the Sky sox and here he is diving back to first. He would get out at second on a ball hit by Ben Paulsen. 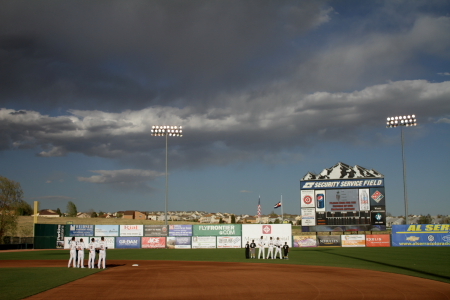 The Sky Sox did go on and score 2 runs in the inning. 1 on a Kyle Parker triple that scored Paulsen. 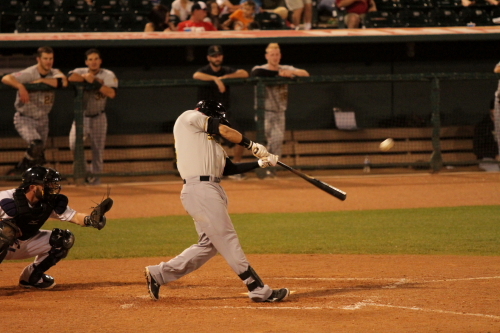 Parker then scored on a McKenry single 8-3 Redhawks. 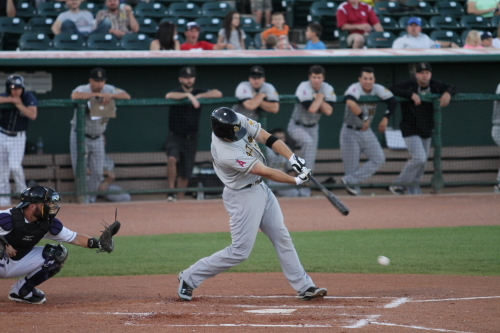 The Redhawks scored another run to give them a 9-3 lead in the 7th. 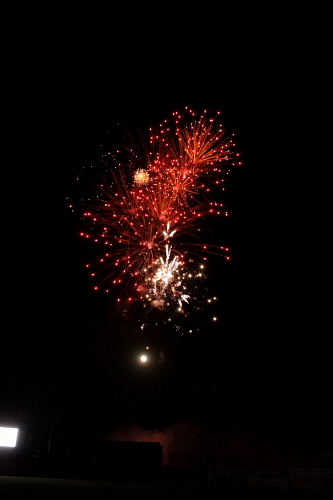 The Sky Sox then had a very good inning in the 7th. The first 2 on a Tim Wheeler 2 run home run, ben Paulsen then hit a homer of his own with McBride on base. Kyle Parker hit one for him self to go back to back with Paulsen. 9-8 Redhawks. 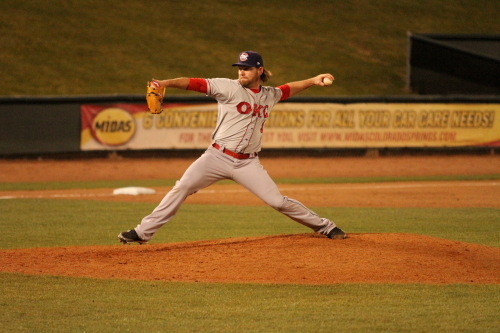 Rudy Owens came into pitch for the Redhawks in the 6th and was responsible for 5 of the Sky Sox runs the 2 in the 6th and 3 in the 7th. Chia-Jen Lo pitched the rest of the 7th inning for the Redhawks and was responsible for the 2 other runs in the 7th. 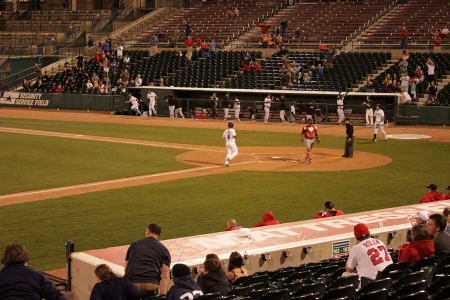 The Redhawks scored 2 more in the 9th and the Sky Sox scored 1 more in the bottom of the 9th. They also had some base runners in the 8th but were unable to score them. That was it for this one the Sky Sox lost 11-9. This was a pretty good game and the Sky Sox did have a few opportunities to get the lead in this game and like the Rockies had trouble getting the timely runs. 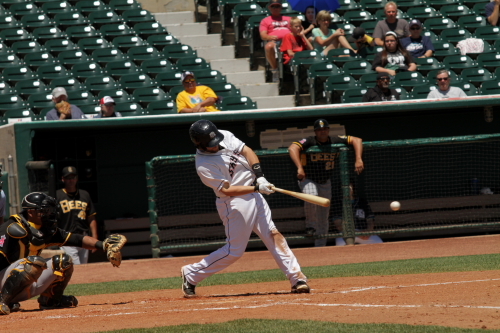 Tim Wheeler did come up a triple short of the cycle going 3 for 5 with 3 RBI’s. 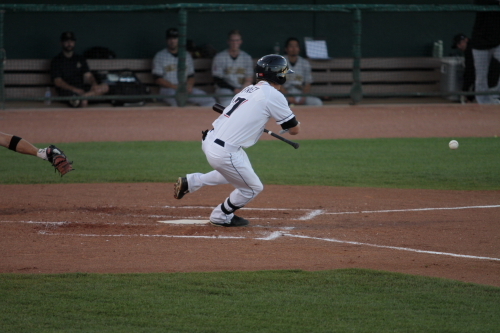 Mike McKenry also hit well also going 3 for 5 and he had 1 RBI. After the game I took the hour and a half drive back home, in total I drove about 300 miles and spent 5 and a half hours just driving this day. But it was a great day doing 2 of my favorite things to do in Colorado Snowboarding and Baseball. So that is it for this one I will be back at Coors on Friday when the Rockies return from there road trip to San Fran and San Diego. Tied at 2 What Shall we do?! The Day started early at Tempe Diablo. We went just for autographs trying to get Albert Pujols, Mike Trout and Josh Hamilton. After a few hours we ended up getting no one. 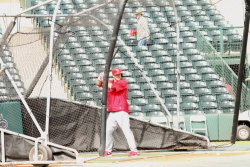 The Angels since they were not playing at Tempe Diablo today had a open to the public batting practice inside the stadium. 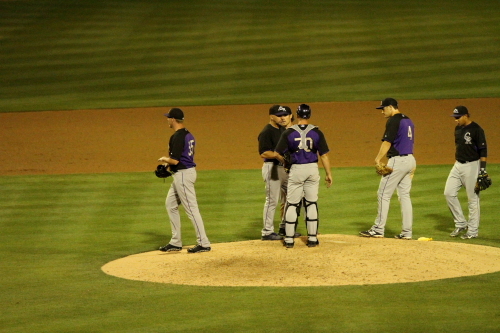 The Rockies had a split squad day the first game was in Scottsdale against the Giants and they lost 4-0. We did not go to the game. 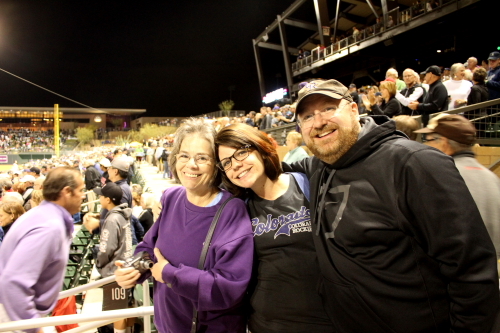 After a break in the mid afternoon we headed to Salt River Fields for the Rockies game against the Mariners. One of y main priorities was to get a Howard Johnson autograph. Above he is talking to Andy Van Slyke. I have gotten Howard before in the Spring but I have a lot of cards of him. I did not get him but I did get Van Slyke. Which was the only autograph I had gotten today. For the second time this trip the first being Mondays game Franklin Morales started for the Rockies. After the first 2 Mariners batters ground out Stefen Romero hit a solo home run to give the Mariners a 1 run lead. D.J. 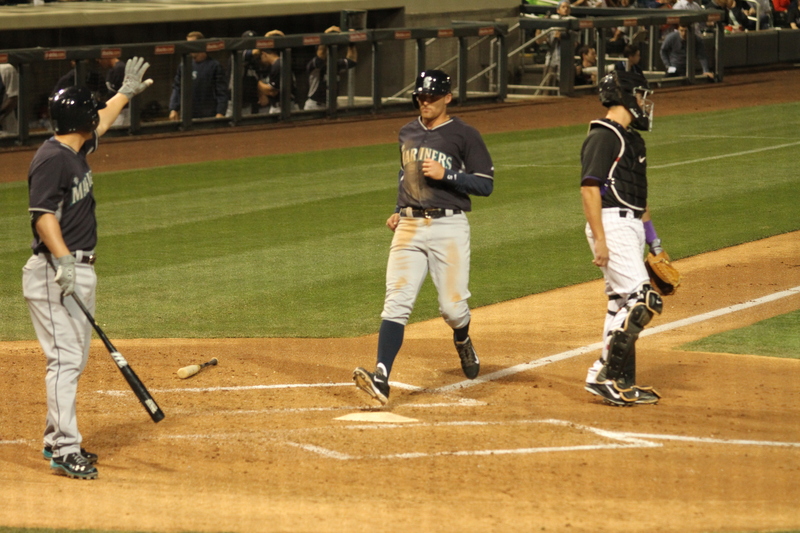 LeMahieu throws to Michael Cuddyer at first base for the second out of the first inning The Mariners Kyle Seager. 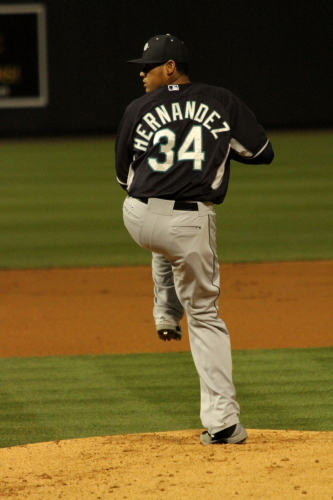 Felix Hernandez was the Starting pitcher for the Mariners. He was lights out in the first inning throwing only 7 pitches and striking out Charlie Blackmon and Ryan Wheeler both on 3 pitches, all swinging strikes. Brandon Barnes who was the second out of the inning was a first pitch ground out. A look from home plate with the full moon over right field. Michael Cuddyer taking a lead off first base after leading off the inning with a single. Cuddyer scored on a throwing error at first hit by Jordan Pacheco to tie the game at 1. The Mariners would game the lead back in the 2nd inning after Brad Miller started the inning for the Mariners with a triple. 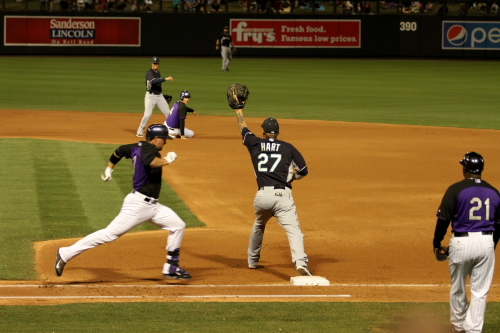 He scored on a Abraham Almonte sac fly to center giving the Mariners a 2-1 lead. 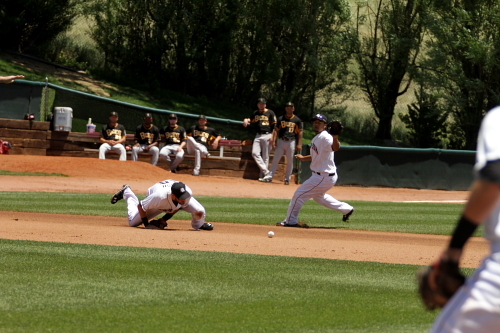 Michael Cuddyer trying to leg one out to avoid the double play in the 4th inning. It was a close one but he was called out. He gives it his all every time he runs down that line. A huge amount of hustle from him wish more of his teammates played the way he does. 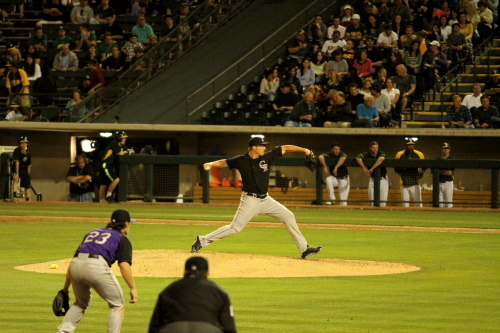 La Troy Hawkins came into pitch for the Rockies in the 5th inning. After loading up the bases the Rockies would get out of the inning starting with a beautifully executed 5,2,3 double play. A ball hit to third, thrown home for the first out and than to first for the second. Love none conventional plays like that, most importantly it saved the run and pretty much the inning for the Rockies. The creative BNW to show off the mad photo skillz. Now back to the game! Rex Brothers pitched the 6th inning for the Rockies. Charlie Blackmon at the plate with D.J.Lemahieu on second in the 6th inning. D.J. would be left on base. I have seen him lead off the inning with a extra base hit and get stranded way to many times last season. I think he should do well batting in the lead off spot if everyone can hit behind him. I saw this a lot last year when he would either start the inning in whatever part of the order he was in or when he would pinch hit to lead off an inning for the pitchers spot or a infield substitution. So he did not score and the game remained the same 2-1 Mariners. Mom, Tara and EB (E2themnfnB) as he was called in his gansta days! Leuris Gomez warming up in the bullpen. He would pitch later in the game. Charlie Blackmon would hit a sac fly in the 8th with Charlie Culberson on third and tied the game at 2. 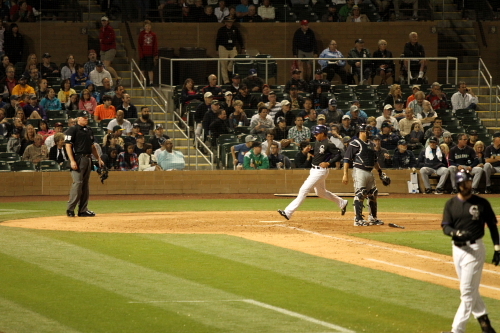 Culberson crosses the plate for the Rockies second run of the game. 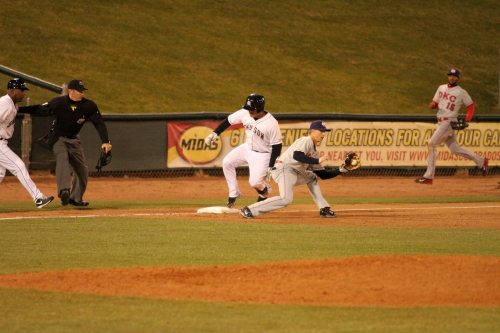 Kent Mathis trying to steal second after his 9th inning single. Notice I sad tried! He was caught and called out! After the Rockies failed to score in the bottom of the 9th it was time for free baseball. Leuris Gomez pitched the 10th for the Rockies only facing 3 batters. He did allow a hit but the runner was caught stealing to end the inning. The Rockies came up in the 10th and tried to start a 2 out rally after a Ryan Wheeler walk. Kyle parker would hit a single, followed by a Tim Wheeler being hit by a pitch to load the base’s Kent Mathis would struck out to end the game and this being Spring Training the game ended in a 2-2 tie. This is the group of the Cool kids who were here for this game! That is it for this one, Only one more game left for me from spring training That is also at Salt River Fields and it is against the Angels. Also you can follow me on tweeter for live tweets and photos from the games. 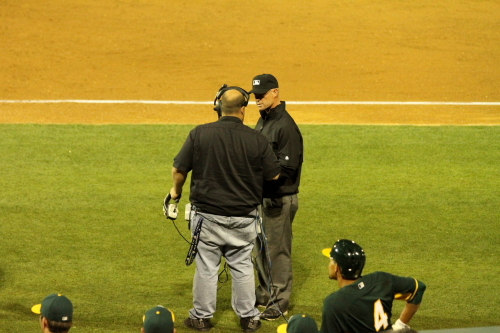 2 for review as the A’s play last night game at Phoenix Muni. 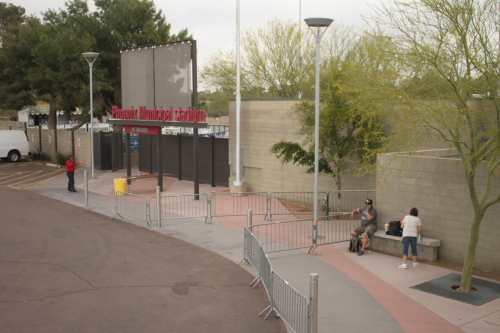 So we arrived at Phoenix Municipal about 3:30. We were waiting for the Rockies bus to arrive which did not show till about 6. So I grabbed some photos of the outside of the stadium while we waited. Smitty said he wanted to be mentioned in this post so see the guy sitting on the bench well that is Smitty!!!!!! Here he is with Ryan Wheelers gloves. That were given to him signed before the game. We waited for the Rockies to show up and got a few autographs including Larry Walker on a ball and Ellis Burkes on card. We than headed to the wall and I got Brandon Barnes on a card. After we entered the stadium we waited by the Rockies dugout for a little bit. 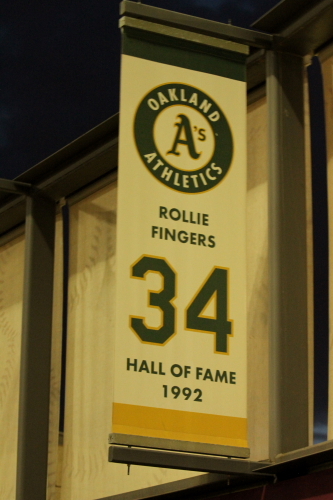 This is one of the few photos I took of details around the stadium they had banners of there Hall of Fame members it was Rollie, Ricky Henderson, Catfish Hunter and a few others. A.J. Griffin was the starting pitcher for the A’s. He started the game by hitting Brandon Barnes. 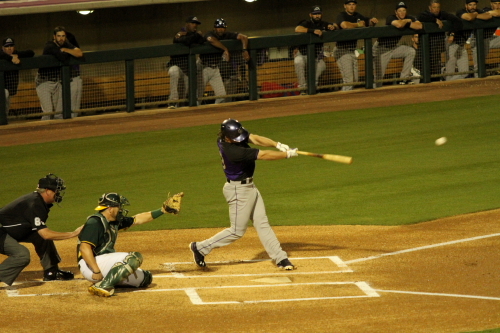 Brandon Barnes being hit by the pitch. Charlie Culberson took advantage of the runner on base by hitting a double to put the Rockies on the board with a quick 1 run lead and scored a second run when Culberson scored on a Corey Dickerson single. Tyler Chatwood was the starting pitcher for the Rockies He seemed to start off a little shaky walking the lead off runner Coco Crisp. After a ball hit by Jed Lowrie that was called a out at first for a double was reviewed via replay and over turned for only a out force out at second. This was the first review I have seen in person. The A’s scored a run in the inning. Wilin Rosario hit a solo home run to tie the game for the second Rockies run. 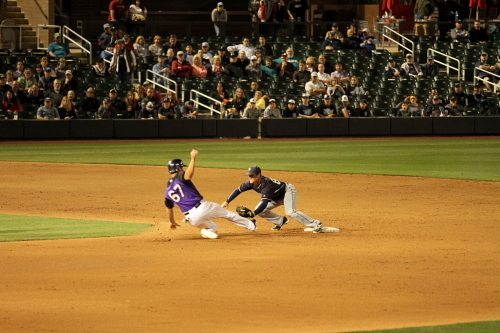 Above is Barnes sliding into third in the 3rd inning. The A’s did take the lead in the 2nd with a run. (3-2) A’s. Barnes did score in the inning to tie the game at 3. The A’s scored 4 runs in the 4th inning and here are 3 of them which happened on a Lowrie double. 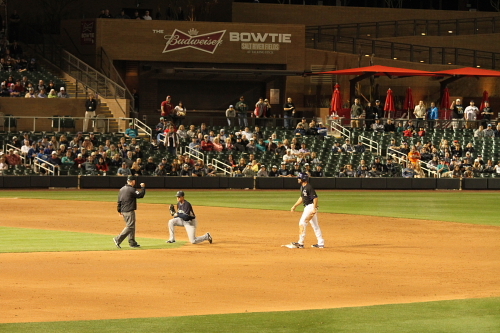 Scoring Nick Punto from 3rd, Coco Crisp from 2nd and Josh Donalson from first. (7-5) A’s after 4 innings. 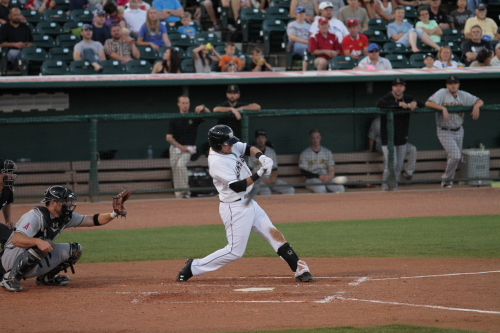 The Rox did score 2 in the 4th on a Tim Wheeler home run. 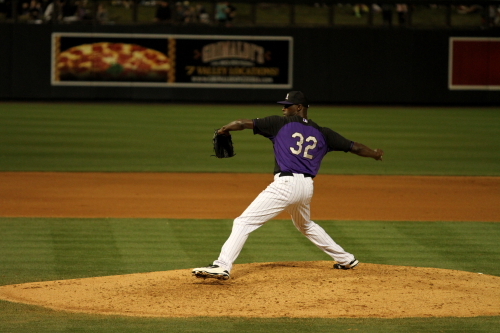 Rockies 2013 1st round draft pick Jonathan Gray pitched He pitched the 5th and 2/3rds of the 6th inning. He gave up 3 runs on 5 hits. 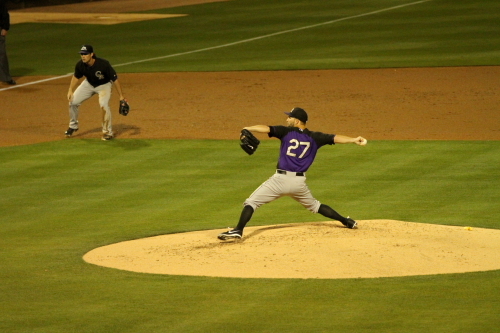 Chatwood left after the 3rd and he gave up 3 runs on 2 hits and walked 2. In the bottom of the 8th there was a second review of a double play. This again at first and the call on the play remained as called on the field. 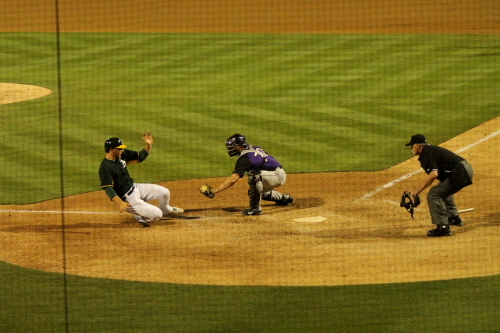 A’s player sliding into home for an out at home in the 7th inning. Jonathan Gray being removed from the game in the 7th inning. the Rockies pitching and a few in field mess ups did not help. 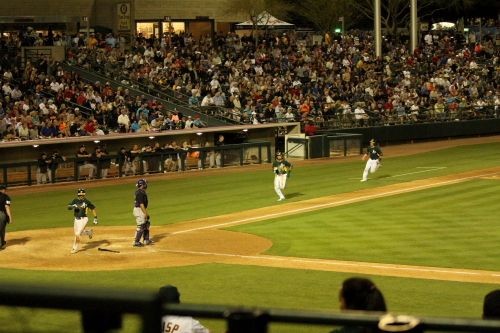 So that was it from Phoenix Municipal this was the last night home game for the A’s in this stadium before they move to Hohokam next year. 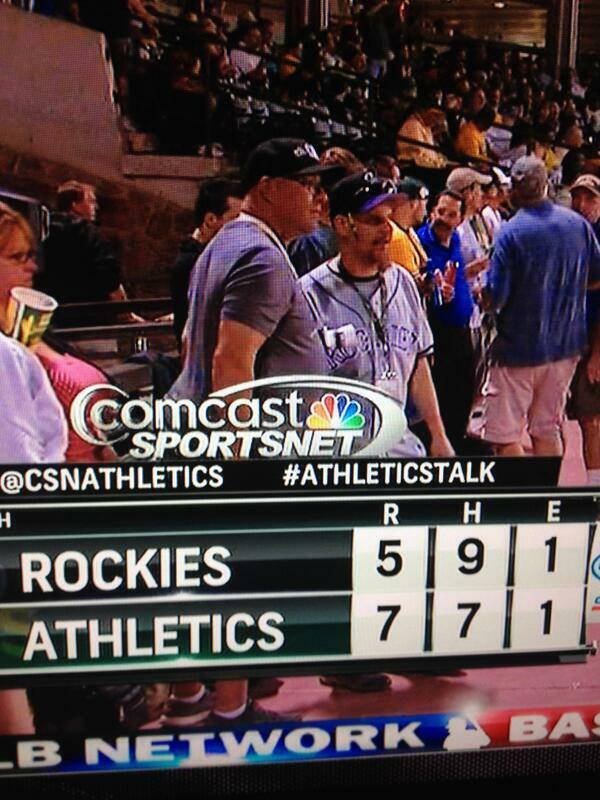 Me and Smitty were on the T.V. Photo Courtesy James from 5280 shirt shop thanks man! 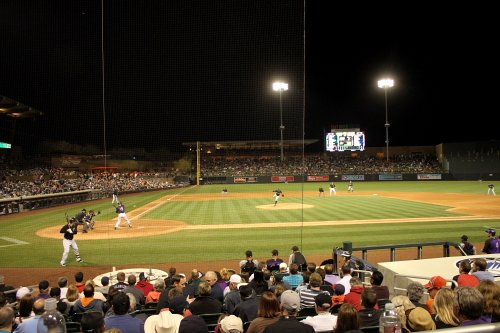 I will be at the Friday Night game at Salt River Fields when the Mariners play the Rockies. Follow me @roxaddict on twitter. Rockies Fest 2011 was held Saturday January 22 @ Coors Field. It is a day where the fans realy get to interact and meet Rockies players and Coaches. 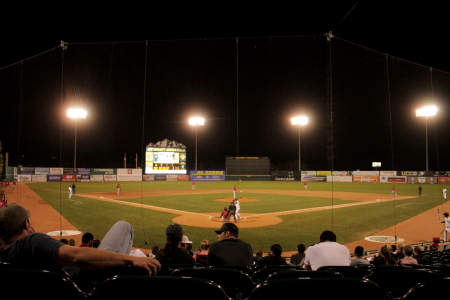 The event is a a great time of year for baseball fans just when we are realy looking for a baseball fix. We are starting to anticiapate Spring Training and the begining of the new baseball season that is just luming in the near future. This was my second year attending the Rockies Fest. Last year was awsome and couldn’t wait to attend this year that I tried so hard to get tickets that I ended up with 2. Thanks to Robert and Judy. 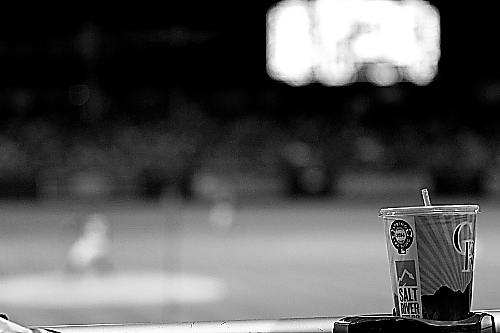 Rockies Fest tickets are only available to Rockies Season ticket holders. So for us non season ticket holders we realy rely on generous Season ticket holders who have extras or can not make it. Thanks again you guys Rock!!!!!! As I was walking from where I parked. I met up with Doug and Geoff. Who are in this photo with Robert. The bat Geoff was holding is a Willie Taveras bat that was used and cracked by Tulo!!!! He later got the bat autographed by Tulo. Gary X Taking a picture of me as we were waiting on line outside. Also in photo Allanah X and Ken in the background. Branding Rockies symbols on old batting practice balls. 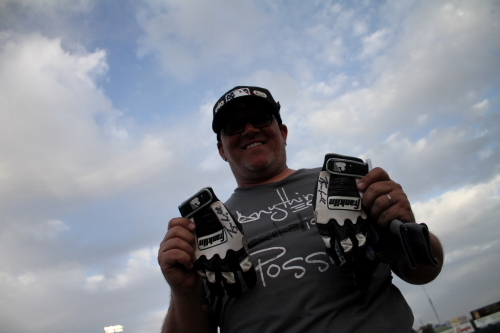 They were for sale for $10.00 and the money went to the Rockies charities. A stack of media guides inside the visiting teams radio booth. The first thing I had tickets for was the 10:30 Interview Session. In the panel were 2 new members of the Rockies Ty Wiggington and Jose Morales. Also on the panel was Rockies 3rd Baseman Ian Stewart, Relief Pitcher Matt Daley, Bullpen Coach Jim Wright and Infield Coach/3rd Base Coach Rich Dauer. The questions were asked by FSN/Root Sports play by play announcer Drew Goodman and sideline reporter Allana Rizzo. Jose Morales answering questions during the 10:30 Interview session. Jose was aquired from the The Twins earlier in the off season. He was a back up catcher to Joe Mauer. When asked about what he had learned watching Joe Mauer play he said, The one things was how he justed played everyday and competed everyday. Rockies Bullpen Coach Jim Wright answering questions during the 10:30 interview session. When he was asked how he was going to keep track of all the Matt’s in the Bullpen he said he would have to work on that one he would have to figure out a FOUR MATT!! !Since their are 4 players named Matt in the bullpen this year. Matt Daley, Matt Lindstrom, Matt Belise & Matt Reynolds. He also said their are 7 realy strong arms in the bullpen an it is a good position to be in, he also is a thrill and honored to work with these players. 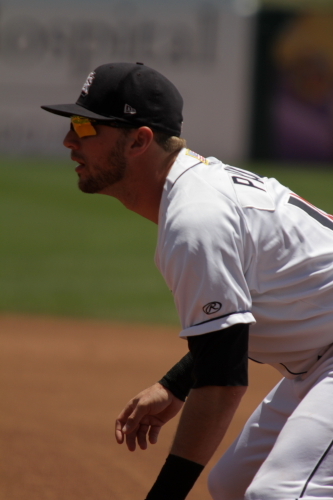 In this Interview session we were also introduced to new Rockies utility infielder Ty Wiggington, Who was picked up from the Orioles in early in December. He was asked which position he felt most comftable in and he said in the batting order ! He said no matter what position he is playing he has learned to keep it simple a ground balls a ground ball, a fly balls a fly ball. you catch it you throw it. chases a Dinger stuffed animal. I asked him if it was for the Llama that he appears with in one of the upcoming FSN/Root Sports Rockies commercial. Cole Gardner outfielder for the Colorado Springs Skysox outfielder Cole Gardner playing video games with young Rockies fan. 2010 Rockies #1 draft pick Kyle Parker signing @ the Minor League and Prospect signing table. Kyle is the starting quarterback for the Clemson Tigers and recently injured his rib’s in the bowl game against Kentucky. He said they are getting better and he is feeling fine. My First autograph session was in the visitors locker room. 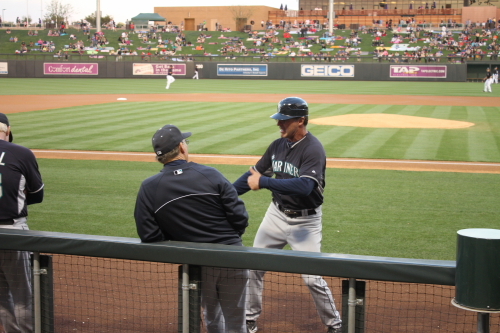 This is a photo of Rockies 3rd baseman Ian Stewart and Infield/3rd Base coach Rich Dauer. The Interview session with the Rockies Front office and Jim Tracy. I did not attend this session but took the photo as I walked past the session taking place.
. Not for anything but Jason should stick to pitching!!! Matt Daley signing autographs after playing Guitar Hero. Eric Young Jr. Playing Just Dance 2 with Rockies fan. On the club level. Ryan Spilborghs signing autographs on the club level. He is signing my ball in this photo. Felipe Paulino and Jose Morales sign autographs on the suite level. I found this photo even funnier after I saw the photo in the background with the hand on the hip. Alannah X talks to Managers Jim Tracy. The bored and lonesome field. This place will be hot soon. Is it April Yet? It would not be a Rockies Event without This Guy (Robert). Photos of my Autographs from Rockies Fest. Autographed Photos of Ian Stewart, Rich Dauer infield/3rd base coach. Jose Morales new Catcher, Felipe Paulino New relief pitcher, Pitching coach Bob Apodaca. Autographed balls Outfielder Ryan Spilbourghs & Jason Giambi. also got all top prospects in my program, Including 2010 1st round draft pick and Clemson QB Kylie Parker. Once again I would like to thank Judy and Robert for getting me Tickets. 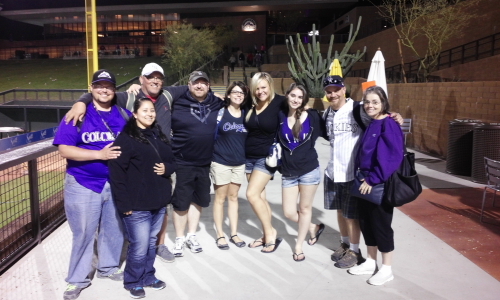 also thanks to “D” The Rockpile Ranter and Gary and Allanah X, Anna and everybody else I hung out with at Rockies Fest.for making the day so great. 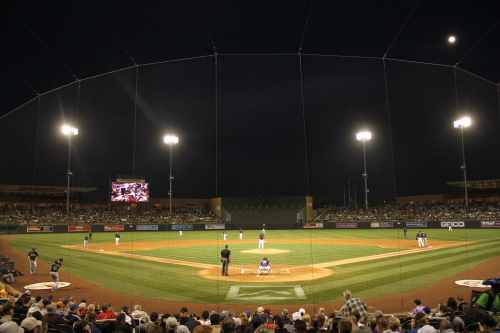 Thats It see Ya in March @ SpringTraining in Scottsdale at Salt River Field @ Talking Stick. I will be there March 18th thru 22nd. Heres a photo not baseball related. It is a new piece of art located at Broadway and Walnut. Lee Friedlander and Mr. F inspired. Here enjoy a few out take photos. Tracy Ringolsby in one of the hallways talking to Rockies Fans. Tulo’s cleat outside his locker in the Rockies Club House, this didn’t make the main part. Because me and “D” the Rockpile Ranter think way to alike and has the same photo posted on his blog.